Revive skin with 28,000 ultrasonic vibrations per second. Four skin treatments merge into one beauty tool to deep cleanse, exfoliate, extract, and infuse topical treatments for visibly smoother, brighter, healthier-looking skin. Resonates at 28,000 ultrasonic vibrations per second. Deep cleanses pores of excess oil and impurities. Accelerates the absorption of skincare products. 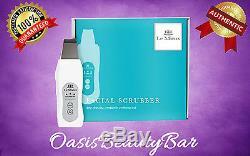 What is it: The Skin Perfecter is a 4-in-1 antiaging device that has three easy steps to use. Who is it for: Anyone who wants to help improve the appearance of their skin. Why is it different: Four skin perfecting treatments combine in one handheld tool. The ultrasonic waves help to gently cleanse, exfoliate, extract, and infuse to reveal smoother, brighter skin; help improve skin's absorption of serums and moisturizers; help to remove buildup using non-abrasive micro-exfoliation; and help to improve the appearance of pores, fine lines, and wrinkles. It's easy to use and never requires brushes, cartridges, or discs. How do I use it: Wet skin thoroughly. Remove protective cap and clean the spatula with water or cotton pad saturated with alcohol. Skin must remain wet during use. To cleanse, hold the unit with the tip of the spatula angled down. Glide spatula from the center of the face, moving outward. Pull the nose to the side, glide the spatula from the edge of the nose toward the center. Repeat on the other side of the nose. Finish by placing the curved end of the spatula at the bottom of the nose and glide the spatula up. Glide spatula from the bottom of the neck up, moving toward the bottom of the chin. When finished, turn off the device and pat face and neck dry. To deep cleanse, switch the unit to the appropriate position, according to skin type. Hold the unit with the tip of the spatula flat against the skin. Glide spatula from the center of the face moving out. Glide the spatula from the center of the nose toward the edge. Repeat on other side of the nose. Finish by placing the flat end of the spatula at the bridge of the nose, and glide spatula down. To infuse, first apply skin care product to face and neck. Switch the unit to the appropriate position, according to skin type. After each use, clean the stainless steel spatula with water or a cotton pad saturated with rubbing alcohol. Cover with the protective cap. Store in a cool, dry place. Facial scrubber device, Power supply adapter (Universal charger), Manual. The item "Le Mieux Skin Perfecter Facial Scrubber Ultrasonic 4 in 1 one year WARRANTY" is in sale since Sunday, August 21, 2016. This item is in the category "Health & Beauty\Skin Care\Anti-Aging Products". The seller is "oasisbeautybar" and is located in Brooklyn, New York. This item can be shipped worldwide.